2000s, 2002, ansi, DOS, games, zzt. So this is a joke, of course, but I do love Shark Aquarium. The details are so scant, and the sharks are basically just grey lines, but it still has more of a sense of place than it’s probably meant to. 2000s, 2002, ansi, DOS, zzt. 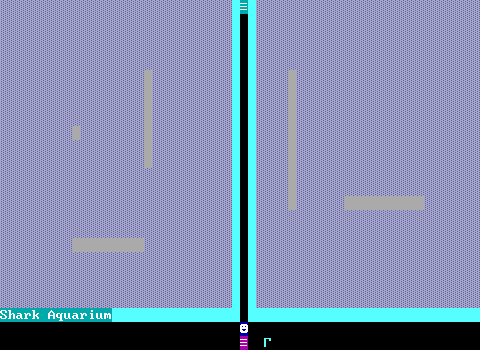 DOS game from 2002, made in ZZT. ANSI-animations made in ASCII-Paint, 2002. Maybe posted before here? Birth of Venus. Delaware, 2002. 2002, cross-stitch, delaware, japan, textile. You made the bank, I made the pyramid. Delaware, 2002.